I’m thrilled to announce that my flash fiction ‘Miss / Hit’ will be published in Issue 7 of FlashFlood Journal. It will be published at around 06:00 BST on Saturday June 27th, which is National Flash-Fiction Day. I’ll post a link to the story in the publications page on the day. 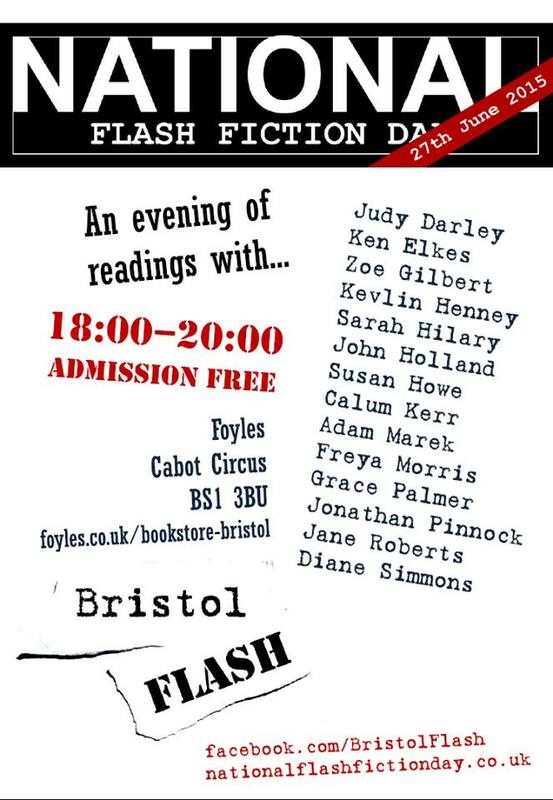 The good news is – you could get your flash fiction published in FlashFlood too! Submissions are open until 23:59 BST on Wednesday 24th 2015, and submissions are free! The only stipulation is that the flash fiction is 500 words or less. So if you want to submit you can do so by following this link. There are lots of things I love about this journal. Firstly, they publish flash fiction throughout the day, hence the name; they intention is to flood the internet with flash fiction, so they publish one every ten minutes (or thereabouts). Secondly, on the three occasions I have submitted writing for this journal it has always been the story I least expected to be accepted for publication that does – this is always a nice surprise for me! Finally, it is run by Calum Kerr and his team of editors who all do a fantastic job with this journal every time it runs, and Calum works incredibly hard to ensure National Flash Fiction Day happens each year. I’m delighted to be included in this journal again, and I urge you all to submit your own writing to this great journal! I hope you’ll all enjoy reading ‘Hit / Miss’ when it’s published – it’s very short! Upcoming Publication in the 2015 National Flash Fiction Anthology! I’m delighted to announce that my flash fiction ‘Saharan Shades’ will be published in this year’s National Flash Fiction Day anthology! Links will be added to the publications page in due course. You can see the full list of stories accepted for this year’s anthology, which is on the theme of Geography by following this link here ——> this one. I adore National Flash Fiction Day – a day dedicated to this wonderfully short but powerful form of writing. I was first published in the 2014 anthology (details of which are on the publications page) so be included in this year’s anthology feels great because it reminds me of my very first publication. There are so many incredible events running this year, details of which can be found HERE. I’ll be going to some of these in Bristol – it will be great to see you there too! National Flash Fiction Day is directed by Calum Kerr, a man who works incredibly hard to make this day happen every year. He’s published numerous flash fiction collections, all of which are excellent, and I encourage you all to read them if you haven’t already done so.